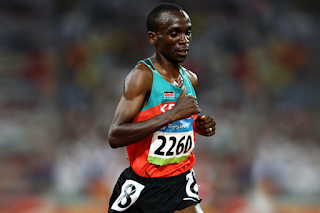 The names of the six athletes who will represent Kenya in the marathon at the Rio 2016 Olympic Games were confirmed by Athletics Kenya on Tuesday (10). World Marathon Majors champion Eliud Kipchoge leads the men’s team, having won last month’s London Marathon in 2:03:05, the second-fastest time in history on a record-eligible course. The 31-year-old will have the opportunity to complete his Olympic medal collection, having taken bronze in 2004 and silver in 2008 in the 5000m. Stanley Biwott and Wesley Korir join him on the team for Rio and both will be making their major championships debut. Biwott won the 2015 New York Marathon and then finished second at this year’s London Marathon in a personal best of 2:03:51. Korir was the top Kenyan finisher at this year’s Boston Marathon, placing fourth in 2:14:05 behind a trio of Ethiopian athletes. The 33-year-old set his personal best of 2:06:13 when finishing fifth at the 2012 Chicago Marathon. Two-time Amsterdam Marathon champion Bernard Kipyego and Paris Marathon champion Cyprian Kotut have been named as reserves. The women’s team comprises three of the athletes who represented Kenya at the IAAF World Championships Beijing 2015. Helah Kiprop took the silver medal in the Chinese capital last year before going on to win this year’s Tokyo Marathon in a big personal best of 2:21:27. Jemima Sumgong, who finished fourth at the 2015 World Championships, overcame a mid-race fall to defeat a quality field at the London Marathon last month, clocking 2:22:58. Her personal best of 2:20:41 was set in Boston two years ago. Visiline Jepkesho won this year’s Paris Marathon in 2:25:53, having finished third there in 2015 in a personal best of 2:24:44. The 28-year-old finished 20th at last year’s World Championships. World half marathon record-holder Florence Kiplagat and two-time London Marathon champion Mary Keitany have been named as reserves.